With the help of her rescue cat, Eddie, librarian Minnie Hamilton is driving a bookmobile based in the resort town of Chilson, Michigan. But she'd better keep both hands on the wheel, because it's going to be a bumpy ride . . . Eddie followed Minnie home one day, and now she can't seem to shake the furry little shadow. But in spite of her efforts to contain her new pal, the tabby sneaks out and trails her all the way to the bookmobile on its maiden voyage. Before she knows it, her slinky stowaway becomes her cat co-pilot Minnie and Eddie's first day visiting readers around the county seems to pass without trouble-until Eddie darts outside at the last stop and leads her to the body of a local man who's reached his final chapter. Initially, Minnie is ready to let the police handle this case, but Eddie seems to smell a rat. 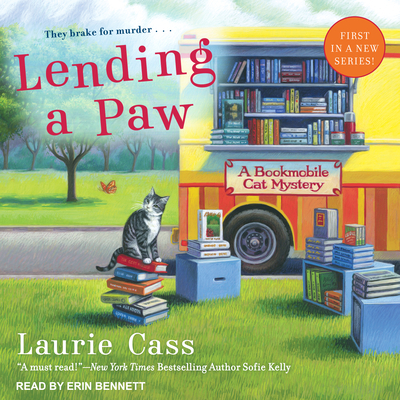 Together, they'll work to find the killer-because a good librarian always knows when justice is overdue.